The adaptation of the Photo Booth with new LED technology cannot be found anywhere else on the market today, and this advancement in technology has introduced the PANTHER REVOLUTION, which integrates a huge exterior LED screen almost 6 feet tall that is an amazing attraction to anyone that sees it. 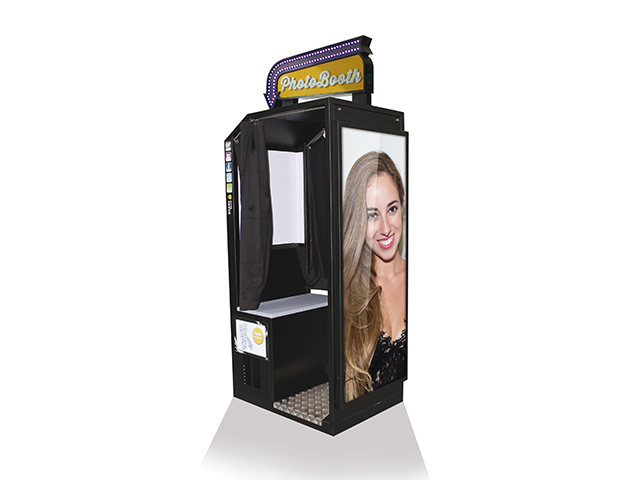 This giant exterior screen displays photos taken inside the Photo Booth, so users can see an enormous size of their photo leaving them with a profound impression’. The Photo Booth giant screen has additional features including the ability to reproduce ads, custom videos, motion graphics, texts, anything the operator wants, to capture the attention of users and increase revenue, in addition to endless entertainment. The user interaction of the Photo Booth features a system that allows customers to instantly upload recorded videos with their smartphones and play it onto the huge screen for all to see. A spectacular attraction never before seen in a Photo Booth!